We had a very early start to vintage in 2015, with generally mild conditions throughout. We had only a handful of hot days, which allowed natural acids to develop nicely. This was a very short, sharp vintage, with most winemakers finishing their vintage well before Easter. Yields were down, somewhere between 10 and 30% depending on variety. Joch’s take on the whole thing? ‘Fast, early and pretty’. 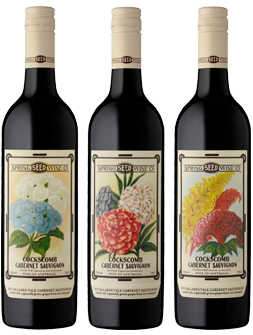 I describe the Cockscomb as the younger sibling of the Bosworth Cabernet. It is grown in the same vineyards and looked after just as well in the winery, but just spends less time in oak, and what oak we use tends to be older and so imparts less oak flavours to the wine. We make it in a very similar fashion to the Bosworth Cabernet, in that it is picked when ripe and full of lovely juicy Cab flavours, then de-stemmed and crushed and fermented in open vessels (some finishes ferment in oak). The oak regime is similar too, with mainly French with a dash of American (ie one barrel!). We do pump overs, too, just the same, where the fermenting juice is pumped over the ‘cap’ (the mass of skins which floats to the top during a ferment) to extract colour, flavour and tannin. Generally Cockscomb is bottled in the same year as it was made and it is ready to be enjoyed pretty soon after that. At the risk of incurring the wrath of the Gods, we do make seem to make lovely cabernets here at Bosworth, and this Cockscomb is no exception. McLaren Vale makes great Cabernets, in fact – we always seem to get nice ripe tannins and herbal intrigue without the greenness The nose is bright and fresh and bursting with blue fruits (violets and red currants ) and the wine has terrific tannins (without being too stiff) and a lovely, persistent finish. All in all a great example of a Cabernet.